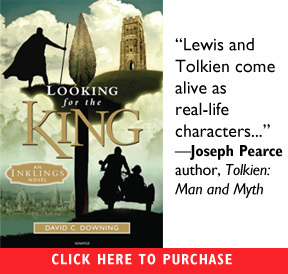 Read the first chapter of the novel Looking for the King by David C. Downing. If you like what you’re reading, visit the novel’s page to learn more or order! “Here lies buried the renowned King Arthur with his wife, Guinevere.” Tom McCord studied the marker in front of a coffin-sized rectangle in the grass, outlined in stone. Or maybe it’s the marker that lies, thought Tom. He knew the story: there had been a great fire in Glastonbury in the twelfth century, destroying most of the abbey and its relics. Pilgrims had started going elsewhere—Tintagel, Malmesbury—until the town’s soothsayer located the supposed graves of Arthur and Guinevere, right there on abbey property. The pilgrims returned—gladdening the hearts of the monks and filling the purses of local innkeepers and tradesmen. “If Arthur did not exist,” Tom muttered to himself, “it might be necessary to invent him.” He shifted the pack on his shoulders and took a step back to survey the ruins of Glastonbury Abbey. Between the blue sky and the green lawn were scattered acres of fallen stones—crumbling yellow walls, staircases to nowhere, dogtoothed blocks jutting out of the earth. Straight ahead were two halves of a broken arch, reaching up to the sky like supplicating hands. This had been a magnificent edifice once, a city in itself, a fortress of faith. But all that remained were walls without a roof, foundations with nothing to support. It was a splendid ruin, but forlorn too. Like religion itself, thought Tom. Walking past the broken arch, Tom spotted a stone building in the corner of the grounds that looked like an abbey in miniature, with sturdy buttresses, arched windows, and a funnel-shaped ceiling. This was the abbot’s kitchen, all that remained of what once had been a grand palace. Tom strode toward the building and peeked in through its single arched doorway. Inside he saw a dim room where motes of dust swirled and danced in the slanting light. Stepping in, he found one great room under a domelike ceiling, with cavernous fireplaces, taller than he was, built into every corner. What feasts must have been prepared here! There was plenty of room for a score of workers and dozens of cupboards and tables. He could almost see a great boar roasting on a spit in one corner, a giant stewpot simmering in another, delicate cakes coming out of an oven nearby. Clearly, the abbot did not live by bread alone. The room was nearly empty now, except for a long wooden bench in front of the fireplace nearest the door. Tom sat down on the bench and set his pack on the ground. He took out three metal rods and screwed them together, making a pole about as long as a broomstick. Then he attached a metal disk to one end and a handle to the other. Clamping a black box onto the handle, he strung two wires from the box down to the disk. Finally, he took out a set of headphones, plugged them into the black box, and put them over his ears. Rising to his feet, Tom held the disk a few inches above the loose flagstones on the floor and took a few steps ahead, moving the device in a slow, sweeping motion, like a scythe. Tick! he heard suddenly. He took another step forward. Tick! Tick! Tick! Tom snatched off the earphones, set down the device, and got down on all fours for a closer look. His rubbed his finger in the dirt between two flagstones and felt some kind of metal object. His pulse quickened as he dug in with his fingernails to uncover whatever it might be—an ancient coin, perhaps, or a gold bracelet fallen between the cracks. Scratching at the dirt until his fingers were almost raw, Tom finally exposed the metal object: a rusty hairpin. Tom scrambled to his feet and looked around. At first all he could make out in the dim light was a silhouette, a tall man wearing a broad-shouldered suit and a derby. “Excuse me?” said Tom, not really in the mood for conversation. The man reached out for the hairpin, inspected it carefully, and handed it back. “Someone’s lost treasure”, he said without smiling. “You found it with that gadget there, I suppose?” he asked. “I thought so”, said the sad-eyed man. “They’ve got those in the army now, for detecting mines.” Holding his hat in front of him, the man gave Tom a long looking over. “You don’t look like a military man”, he said. Tom unconsciously brushed his sandy blond hair out of his eyes. He didn’t really feel like having a chat, but this fellow seemed to insist on a conversation. So Tom decided he could keep it up for a least a few minutes, out of politeness. “We’ll see about that”, said Huffman solemnly. “That’s what they said back in 1914. They told us we’d be home by Christmas.” Huffman mused to himself a moment, then turned back to Tom. “So, tell me about this book you’re writing”, he said. Huffman gave Tom another long looking-over and pointed to the Metallascope. “Surely, you don’t need that thing to locate books”, he said with a wan smile. Feeling that he’d said enough, or more than enough, Tom strode toward the doorway. Huffman gave a slight whistle and suddenly there appeared in the entrance a burly man with a red face. He stood right in the narrow exit with his arms folded across his chest, wearing a wrinkled shirt and a baggy tweed jacket. Tom had played fullback in high school, and his first instinct was to bowl the man over and not look back. But he didn’t like the odds, and he wasn’t sure who else might be outside. He turned back to Huffman. “You’re not letting me leave?” he asked. “I wouldn’t put it that way”, said Huffman with unconvincing friendliness. “It’s just that we were having such a lovely chat. This is my associate, Mr. Durham. He has some interests similar to yours and mine.” Durham nodded his head without unfolding his arms. “Last I heard, the bloke was dead”, said Durham gruffly. Durham took a step forward, as if he’d heard fighting words. Durham’s eyes widened. “Oh, he does, does he? And what gave him that idea?” Huffman and Durham both looked at Tom, as if he’d have to answer that one for himself. Huffman made a downward sweep of his hand, as if trying to calm everyone down. “No need for that kind of talk”, he said calmly. Durham just grinned and patted something underneath his jacket. Durham took a step toward Tom, but Huffman signaled for him to stand still. “Let’s find out who he really is”, said Durham, stepping out of the doorway and reaching for the pack at Tom’s feet. Tom pointed the metal detector straight ahead, like a lance, and turned up the dial on the box until it made a distinct hum. “Keep your distance”, said Tom. “That is, if you ever hope to have children!” Durham froze and then took several steps back, pulling his jacket down tight in front of him. Huffman laughed out loud, the sounds reverberating throughout the small enclosure. “He’s bluffing, you idiot!” said Huffman. Tom scooped up his pack and ran toward the entrance. Durham made a quick lunge at him, grabbing hold of Tom’s jacket. Not having a free hand, Tom tried to stomp on Durham’s foot but missed. “Let him go, Durham, let him go”, Tom heard over his shoulder. Breathing heavily, Durham thrust his face about an inch away from Tom’s, glared at him eyeball to eyeball, then let go of his jacket and walked back to Huffman’s side. Tom clutched the pack and the metal detector to his chest and caught the welcome sight of green grass and blue sky just over his shoulder. He backed out of the room, seeing the forms of the two men still standing near the doorway. “Just one more word?” said Huffman, with the same forced politeness he had used when the conversation began. Tom knew it would be wiser just to keep walking, but he wanted to show them, and maybe himself, that he was no coward. So he stood in the doorway, his back to the sun, and glared at the two figures standing in the dim light. “Maybe you really are who you say you are”, said Huffman. “And maybe you’re as thick as you seem to be”, added Durham. “Auf Wiedersehen”, Tom heard behind him. “We’ll see you again.” He walked hastily away from the stone kitchen, toward a guard booth he’d seen when he entered the grounds a few hours before. His heart was thumping in his chest, partly for the sheer joy of being outside in the open air, safe and free and surrounded by ordinary people just enjoying the day. But there was also anger and fear in that beating heart. Who were these men, and what did they want? How dare they treat him that way? And how dare he let them? Tom had visions of taking on both of them and leaving them on the ground writhing in pain. But that sort of thing seemed to work better in movies than in real life. Tom glanced over his shoulder to make sure no one had followed him. His stride had almost become a run, and he forced himself to slow down to a brisk walk. When he got to the entrance to the abbey grounds, there was no one in the guard booth, but there were plenty of people coming and going, so he felt safe enough. What a relief and a pleasure it was just to see a little red-cheeked girl reaching up with stubby fingers to grab onto her mother’s hand. Or to watch a white-haired man and his frail wife standing close together to admire the pink wildflowers growing on top of a stone wall. Tom sat on the lawn and laid down his pack and his Metallascope. He started to disconnect the wires, but it took a few tries because his hands were still trembling. Taking a deep breath, he steadied himself and carefully unhooked the wires, coiled them up, and put them into the pack. Then he removed the disk at the end and unscrewed the sections of pipe. It was good to have something to do with his hands, something he didn’t have to think about. The more he relaxed, the more the whole incident seemed almost farcical to him. Here he was, trying to write a book about King Arthur, and those thugs acted like he held the fate of the world in his hands. What was it they thought he was after? If Huffman’s intent was to quench Tom’s curiosity, then he had mistaken his man. An hour ago, Tom would have been thrilled to find a Roman coin or a centuries-old shoe buckle. But now the question that blazed in his brain was, What should he be looking for?